All images are Copyrighted by Myself. Do Not use them for any reason. Agile, Perfect vision. 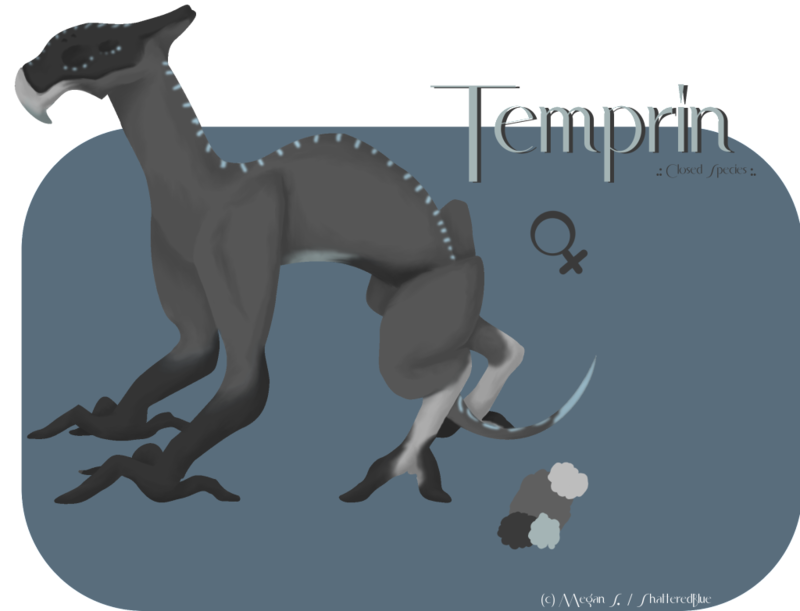 Temprin is a smaller creature for her species, but that comes with it's advantages. The reptile can easily scale large trees much faster than a larger predator would be able to catch her, making her survival skills finely tuned. She goes off sight before any of her other senses and even in the pitch black can see the smallest of creatures. Hearing is a bit bad. Being a nocturnal creature with bad hearing is not the best situation in the world, many things can be missed or overlooked by sight and smell. Light blue stripes run up the creatures dome and all down her spine to the very tip of her tassel. Four small dots lie under all of her eyes. These markings can be controlled and glow with certain patterns or pulses that signal others of her species. Other markings that do do not change consist of deep greys along her crown and feet, along with an almost white color on her hinds and lower jaw. Temprin is usually a very quiet and independent female, but has her stubborn side to her too. She doesn't easily accept help from strangers and can be difficult to deal with at first. When the little thing finally warms up to someone she's easy to love as she likes to vocalize her affection greatly and calms down quickly from her stubborn streak. Other than that Temprin easily gets along with others of her kind but usually doesn't stick around long as instinct usually drives the species back into travelling alone.
.:Closed Species You cannot have a character of this species unless I personally make you one:.
.:Feet are much like a frogs in which their toes can stick to surfaces to allow them to climb easily:.
.:Saliva is extremely toxic, secreating a deadly Neural Toxin that is injected either through being bitten or through rings in the tongue:.
.:Vocals come in a wide range of varietys, "Ancients" aren't able to hear many of their sounds:.
.:Usually live alone or in mated pairs once a mate has been found:.
.:A very docile species other than when provoked and can be extremely aggressive:.
.:Omnivorous but prefers meat over plant:.
.:Females regularly come into heat in random cycles throughout the year but breeding season is always during the late fall:.
.:Eggs are typically laid in the early summer but can be throughout the year, if laid in the winter the eggs will not survive:.
.:Mated pairs can be very territorial of their land and often drive others out without a second thought:.